The Infant King is HERE!!! To watch the video, move your cursor to 0:42 seconds and press play. Special Note: You’ll want your Bible present to look up passages. If you have anything other than RSV, NAB, KJV, or NIV, then your translation might lead you astray. The newest translations are very loose with little holding to the original Latin text. And if you’re Catholic, I recommend the RSV, it’s the closest to the Latin text next to the Vulgate. You’ll find Scripture colored maroon, the Catechism colored in deep green, with the Tradition parts in various shades of blue and purple, while my comments are left plain; and as always, emphasis has been added when appropriate. In this post, we have dialog of the Blessed Virgin and St. Joseph italicized along with St. Elizabeth who appears at the moment of the Visitation, closing with the Archangel Gabriel visiting the shepherds in the field. Before you begin this reflection, please take a moment to read the INTRODUCTION . Even before Mary held the WORD of God in her arms for the shepherds to adore, she brought Jesus to those who needed Him most that they might know how much God LOVES them. In particular, the forerunner of the Messiah, the “voice crying out in the wilderness”, that is John the Baptist. Three days after the Annunciation the Lord revealed to Mary in a vision that the son whom her cousin Elizabeth had already conceived was destined to be a great prophet and forerunner of the Messiah, and that it was God’s Will that Mary should visit her in order that both mother and child might be sanctified by the presence of their Redeemer. How is it that the Mother of my Lord should come to me? John is “Elijah [who] must come,” (cf. Mt 17: 10-13; Lk 1:78). The fire of the Spirit dwells in him and makes him the forerunner of the coming Lord. In John, the precursor, the Holy Spirit completes the work of “[making] ready a people prepared for the Lord,” (cf. Lk 1:17). Three days later, St. Joseph returned to his work in Nazareth, as Mary planned to spend three months with her cousin. 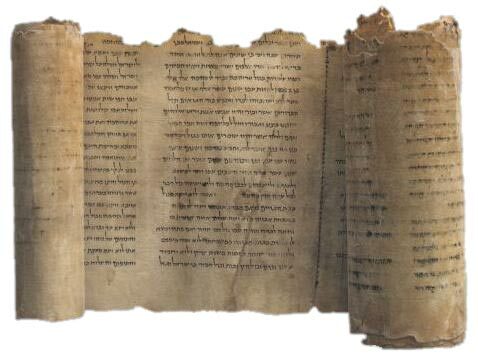 [Then] one day St. Joseph, while away from home on errand, heard that a recently proclaimed Roman edict ordered all heads of families in Palestine to be registered on the tax lists in their native cities. 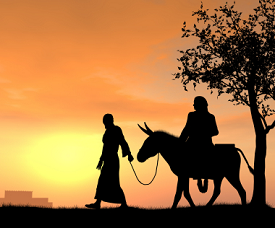 Her heart being thus prepared for what lay ahead, calmly told St. Joseph that she was going to travel with him. At six o’clock on a cold, wet, mid-winter morning, the Blessed Virgin and St. Joseph set out from Nazareth on their journey to Bethlehem. She was, by sheer grace, conceived without sin as the most humble of creatures, the most capable of welcoming the inexpressible gift of the Almighty. 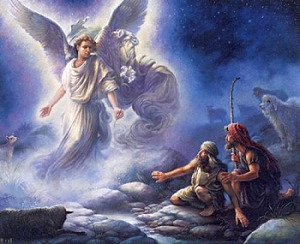 It was quite correct for the angel Gabriel to greet her as the “Daughter of Zion”: “Rejoice,” (cf. Zeph 3:14; Zech 2:14). It is the thanksgiving of the whole People of God, and thus of the Church, which Mary in her canticle, (cf. Lk 1: 46-55), lifts up to the Father in the Holy Spirit while carrying within her the eternal Son. Later, as the sun was sinking, they began to look for lodging. While Mary waited at the end of a street, Joseph went down it from house to house, knocking at the doors of his relatives and acquaintances, but he was admitted nowhere, and in many places he met with harsh refusals and insults. Finally, about nine o’clock, St. Joseph came back, utterly overcome, crying and trembling with heartbreaking sorrow. 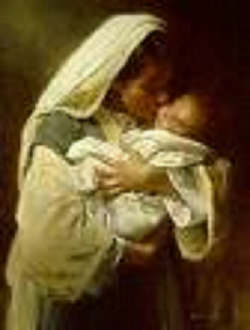 Mary consoled him tenderly. Then he told her of a shepherd’s shelter outside the town. Upon entering the bare grotto which the shepherds use as a stable, they both knelt and thanked the Lord, and Mary was filled with joy at being at last in this holy place. She immediately set about cleaning the cave with her own hands…St. 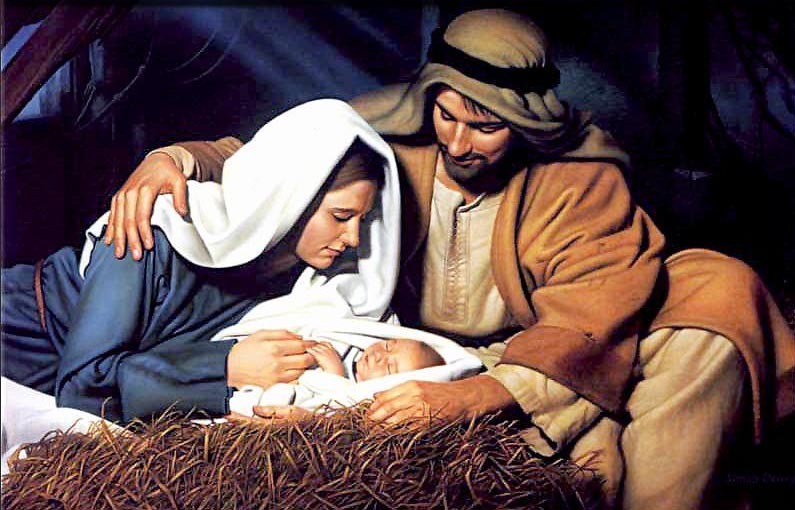 Joseph…[did] likewise, and the angels helped them…they ate a frugal supper, their hearts overflowing with happiness at the thought of the impending Incarnation. Reciting some prayers together with Mary, St. Joseph filled the manger with straw and moss and placed a cloth over it. Then he withdrew to the entrance of the cave. Looking back, he saw the holy Mother of God praying on her knees, surrounded by flames of dazzling supernatural light. Filled with reverent fear, he threw himself down on the ground and was soon rapt in an ecstatic sleep. Mary was kneeling, with her eyes raised to heaven and… Her countenance emitted rays like the sun incarnadined, and shone in indescribable earnestness and majesty, all inflamed with the Light of God… Toward midnight a channel of brilliant light came down from the highest heaven and terminated in sparkling fire at the Blessed Virgin. In it was an extraordinary movement of celestial glories which took on the forms of choirs of angels. Then, in the twinkling of an eye, the infant God was born, glorious and transfigured as on Mount Thabor. There the God-Man lay, naked, utterly clean and pure…from Him radiated such marvelous light and splendor that the sun could not be compared to it. Welcome my God and my Son! Then the divine Child suspended the effects of His figuration and assumed the appearance of one capable of suffering. Have this mind among yourselves, which is yours in Christ Jesus, who, though He was in the form of God, did not count equality with God a thing to be grasped, but emptied Himself, taking the form of a servant, being born in the likeness of men. And being found in human form He humbled Himself and became obedient unto death, even death on a cross, (cf. Phil 2:5-8). The Babe now moved, shivered with cold, and stretching forth His little arms, cried out… Bending down, Mary tenderly clasped Him…with great joy and warmed Him against her cheek…while thousands of angels knelt and adored their incarnate Creator. 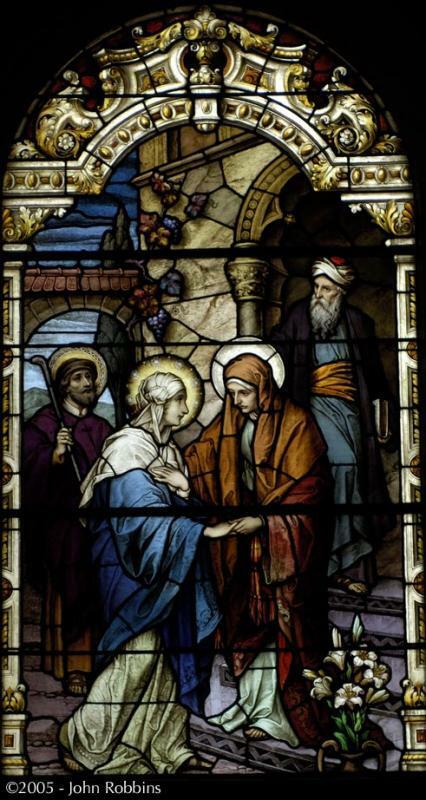 Nearly an hour after the birth, Mary called to St. Joseph. Awakening…he perceived his Savior in her arms and at once prostrated himself …[in] deepest devotion and humility. 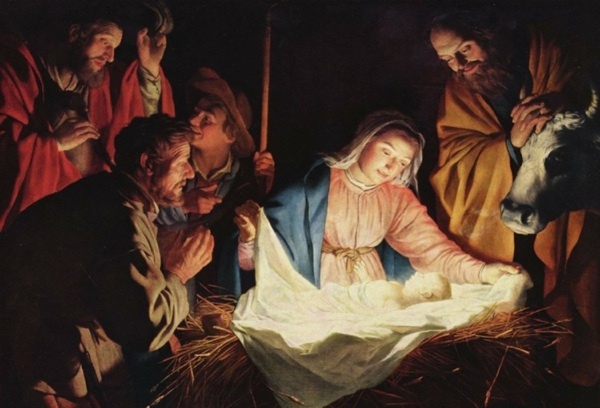 Only at [Mary’s] bidding did he rise… [and] with touching joy and gratitude he kissed the Babe’s feet, and [then] held the little Jesus in his arms…while tears of happiness moistened his cheeks. [Then] St. Joseph took some blankets and made a resting place for Mary beside the manger. 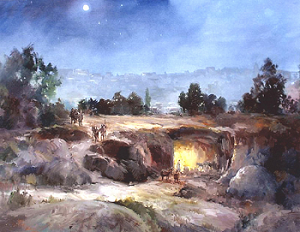 To the shepherds, the angel announced the birth of Jesus as the Messiah promised to Israel: “To you is born this day in the city of David a Savior, who is Christ the Lord,” (cf. Lk 2:11). From the beginning he was “the one whom the Father consecrated and sent into the world,” conceived as “holy” in Mary’s virginal womb, (cf. Jn 10:36; Lk 1:35). God called Joseph to “take Mary as your wife, for that which is conceived in her is of the Holy Spirit,” so that Jesus, “who is called Christ,” should be born of Joseph’s spouse into the messianic lineage of David, (cf. Mt 1:20; 1:16; Rom 1:1; 2Tim 2:8; Rev 22:16). 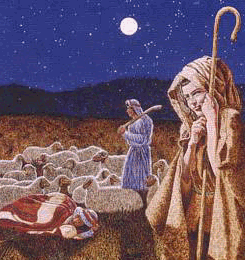 And in that region there were shepherds out in the field, keeping watch over their flock by night. Only toward dawn did they find the grotto-stable and knock timidly at its entrance. St. Joseph… opened the door and welcomed them. They told him what the angels had announced to them during the night, and they said that they had come to offer their gifts and veneration to the divine Child. Then [Joseph] led the shepherds into the grotto, where the Blessed Mother of God was sitting on the ground beside the crib in which the beautiful Babe of Bethlehem was lying. Be not afraid, I bring you tidings of great joy! Still holding their shepherd’s staffs in their hands, they very humbly knelt down before the Infant Jesus…[and] weeping tears of joy…they adored their God…[and] they began to sing together the words and melody which the angel had taught them. The Father’s only Son, conceived as man in the womb of the Virgin Mary, is “Christ,” that is to say, anointed by the Holy Spirit, from the beginning of His human existence, though the manifestation of this fact takes place only progressively: to the shepherds, to the magi, to John the Baptist, to the disciples, (cf. Mt 1:20; 2: 1-12; Lk 1:3-5; 2: 8-20; Jn 1: 31-34; 2:11). Thus the whole life of Jesus Christ will make manifest “how God anointed Jesus of Nazareth with the Holy Spirit and with power,” (cf. Acts 10:38). Holy Mary, Mother of God, pray for us sinners, now and at the hour of our death; Amen! “Who would be so hardened as not to be moved to tenderness the sight of their God become man, humiliated in poverty, despised, unknown, entering the world in a cave, lying on a manger surrounded by brute animals, protected only by a poverty-stricken Mother, and cast off by the foolish arrogance of the world? Who will dare to love the vanity and pride which was openly scorned and condemned by the Creator of heaven and earth in His actions? Let all men speak, and give Him thanks in Jerusalem. O Jerusalem, the holy city, He will afflict you for the deeds of your sons, but again He will show mercy to the sons of the righteous. Give thanks worthily to the Lord, and praise the King of the ages, that His tent may be raised for you again with joy. May He cheer those within you who are captives, and love those within you who are distressed, to all generations forever. Many nations will come from afar to the name of the Lord God, bearing gifts in their hands, gifts for the King of heaven. Generations of generations will give you joyful praise. Rejoice and be glad for the sons of the righteous; for they will be gathered together, and will praise the Lord of the righteous. How blessed are those who love You! They will rejoice in Your peace. Blessed are those who grieved over all Your afflictions; for they will rejoice for You upon seeing all Your Glory, and they will be made glad for ever. Let my soul praise God the great King.